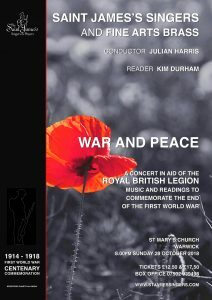 The St James’s Singers present a concert of readings and music to commemorate the end of the First World War one hundred years ago in 1918. 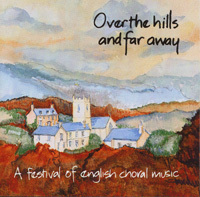 The concert takes place at the Collegiate Church of St Mary, Warwick, on Sunday, 28 October, and starts at 8.00pm. 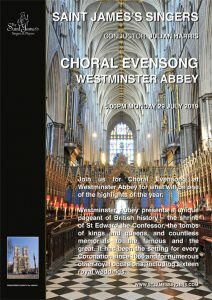 We have put together a programme of music and readings which will provide a rich tapestry of genre and mood to cover many aspects of this event. Readings and music will range from serious and sombre reflections on the suffering involved to consideration of the heroism, the comradeship and the humour used by the troops themselves that helped them get through. We are delighted that we will be joined in this event by the fabulous Fine Arts Brass, and, as our reader, the actor Kim Durham.